Nice and clean and cozy Very nice. Small and cozy. The place is brand new and very clean. Having an amazing time ! Fabulous place and location. Beautiful beach view Very nice condo with beautiful view of the beach. Well equipped, clean, and comfortable. Great location. Loved the proximity to the beach and St Augustine. Spacious accommodations for 4 people. There is an additional bed for a child off the kitchen and entry way. Great to have a washer/dry and a few chairs to take to the beach. 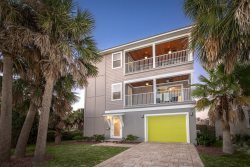 Great location, clean and comfortable Easy access to the beach with great views from the screened in patio. The private beach entrance has a shower to rinse the sand off before going back inside. Easy walk to a variety of restaurants (1/2 - 1 1/2 miles). We traveled in March (outside spring break) and it was very peaceful and quiet. Inside was clean, even to my wifes high standards. The beds were very comfortable. The property sleeps 6 with a huge king bed in the master and a queen in the second room and a queen pull out couch. Everything we needed to cook a few meals. We are not gourmet cooks so if you need something non standard you will need to bring it. There were 3 or 4 beach chairs and sand pails ready to be used at the beach. 4 beach towels were provided but they were very small. We brought our own and recommend you do the same if you plan to swim or lay out in the sand. Would definitely recommend this property if you are looking to stay in St. Augustine. Short walk to beach, taco shop across the street was great, best coffee shop in the area about a block away, great beach bar about a block and a half. Management company responded immediately to any questions or issues. Property was very quiet. Planning to go back again. My Canadian friends and I had an amazing time at the Yeager Florida house. This property is simply awesome!... very comfortable, equipped with everything you can possibly need... The decks that surround the house were great for sunbathing, cooking out, or just relaxing! The view of the water on both sides of the house was amazing! Thanks Yeagers for an unforgettable family vacation! The view of the ocean and beach was AMAZING! Ocean sound were delicious! Surfers entertained us! YEA What a great place to be with sunshine and the wide expanse of beach to walk. Glorious days with surf and surfers and kites flying. Couldnt have wanted a more restful vacation! Well be back!! Very clean, comfortable and relaxing. Convenient to many restaurants. We were so happy when we walked into the condo and it was so clean and the decor was inviting. It had everything we needed in the kitchen. There were plenty of towels. It was located in a great spot for restaurants and to pick up groceries and a coffee. Definitely will stay again. Ben 15 Clan Where do we start in describing all of the amazing perks of staying at the 12 5th Street house? Lets begin with the house itself. With its tons of space and multiple floors we were able to fit our extended and ever-growing family; better yet we were able to separate the teenagers from adults by floor Each level has its own bathroom and the bottom floor has an additional kitchen and breakfast area. The top floor with all its open space was where most of the family congregated playing games, family meals, sitting on the patio deck looking at the ocean / sunsets, and watching Bowl Games. Now to the outside and most important part location, location, location. The house is just a stones throw away from the incredible soft beaches. In addition and in easy walking distance, there are restaurants, coffee shops, ice cream parlor, surf shops and more. We will definitely return to this slice of paradise and highly recommend the house at 12 5th Street to anyone looking to make lasting memories. Our Family of 10 including parents, grown kids with spouses and their children. 3 generations under 1 roof for 1 terrific week! The beach is so gorgeous here and Historic St. Augustine offers history, shopping and dining. The pool area allowed the perfect beach and pool combo. The kids could chill/play/swim; we could watch the baby and all of the adults could talk and enjoy appetizers. Elevator was a plus for myself (65) and husband (69) with knee replacements. Beds and all linens are great. Comfortable areas to all congregate for our annual "Family Vacation". We even celebrated Poppy turning 69 with cake and candles. The 12 5th Street house is spectacular. It has everything you need and MUCH MORE. 2 min walk to the beach. 10 min by car to the center of Saint Augustine. It has elevator, two refrigerators, swimming pool, barbecue, washing machine and dryer. Excellent, I would definitely go back! " Peaceful retreat! We love this property! Relaxing and peaceful - beach view from the porch and a few steps gets you onto sand. Decorated beautifully so you feel very "beachy" there. Love the floor plan and allows for visiting, relaxing, cooking in or just kicking up your feet! Cozy spot right on the beach Absolutely loved this place. I loved the area!! The beaches were amazing and just an overall perfect spot. Highly recommend. First time in St. Augustine, and we loved it! From the beach to the old city and lots of great food! The condo was very nice and clean. Plenty of room for 4 adults and 2 kids. Very short walk to the beach. Loved the views from the balcony. The pool area was very well landscaped. Parking was tight for our crew cab trucks, but was aware before we booked the unit. Overall, it was a great place to stay. Hope to be back next year! Love the place!!! Very nice and comfortable condominium, that meets our expectation. Highly recommended for families with kids, very well equipped :) our little one especially loved wagon with all beach toys. The condo was very nice! Great location, very clean and convenient to everything we needed. Just a short drive up to Historic St Augustine, walking distance to several restaurants and bars. We had a great time! A perfect honeymoon St. Augustine is my husband and Is favorite place in the whole world, so coming here for our honeymoon was a complete no-brainer, but this condo took our stay to a whole new level. It is ABSOLUTELY GORGEOUS. The ocean views are incredible and watching the sun rise over the water was breathtaking. The condo is truly perfect... plenty of space, beautifully decorated, a gorgeous, fully-equppied kitchen, comfy beds, and a massive shower in the master. We truly could not have asked for more. Its literally steps from the beach and the building has a lovely pool too. The building is quiet and all the neighbors were so friendly. Its also in a great location, within walking distance to some of our favorites: the pier, Sunset Grill, and Coneheads Ice Cream :) Thanks for making our honeymoon absolutely perfect. We enjoyed our stay here so much. We will most definitely be back! A vacation rental that exceeded all of our expectations My husband and I have had a challenging year and when we were finally able to get away for a week, we couldnt have chosen a better place to relax and just enjoy life. Your condo is absolutely perfect and welcoming. The location is fantastic. The walk to the beach is short and it is a beautiful beach. The hot tub and pool area are wonderful. My husband and I thoroughly enjoyed our week at your condo and cannot say enough good things about it. Endless Summer Vacation Rentals was very easy to work with and went above and beyond what we expected. The condo is well equipped and furnished. Everything was pristine and the elevator made it more convenient. Restaurants and shops are very close by. We hope to be able to come back soon. We would give it more than 5 stars if it were possible. Thank you for sharing your home. Clean, comfortable with beautiful view. Enjoyed watching the surfers catch a wave! "Loved condo. Clean; nicely decorated!!! Highly recommend"
"very nice condo additional items available for our use such as beach towels and chairs clean and near. would stay again"
AMAZING My husband and I stayed here for our honeymoon. Everything was super clean and the views were amazing. It is super close to St.George Street, the Fort, an alligator farm and so much more. We are already planning another date to stay here. If you have a chance, go grab a coffee from the Kookaburra Cafe.